I hazily remember having seen a blonde Pedigree Sindy at a doll show one year many years ago. I guess I wasn't ready for her then. It was a matter of time, I suppose. After rediscovering my sister's Hasbro Sindy (blogged HERE), I had contemplated over getting my own Sindy for some time. Only I'm partial to the even older ones with the big heads. I recently snagged a Sindy lot on Ebay with her closet and a bunch of tlc clothes for a good price. The closet itself is in really good condition with the expected yellowing due to its age. The clothes varied in state and most of them need mending. One of the calico print dresses was in excellent condition while I had to sew the snaps back on the other one. How fascinating that even though the floral print on the dresses are the same, they actually slightly vary in shades and the cloth material on one is softer than the other. Plus, the lace collar is designed wider on one and not the other. One can never go wrong with a brunette Sindy in a doll lot. There are too many blonde Sindys! She's not perfect by any means. There's a hairline crack on one of her hands. Her hair was hideous and standing on end when I got her but she cleaned up nicely. I'm not a fan of the strange way her hair is thinly rooted all around except the crown. I've read somewhere that some Sindys tend to have thin hair and my brunette doll is no exception. It also looks like someone had fun with scissors and this doll at some point in time. Still, she's super cute! Here's a dress that is a part of Sindy's fashion called 'Let's Have a Dinner Party' from the lot that I tried to salvage. It's missing the overcoat, headband and shoes. Three of the four snaps were hanging off and the velcro to hold the collar was gone. The dress itself was very wrinkly. I actually washed it and tried to iron out the wrinkles so it looks so much better than before even though it's still wrinkly. I was afraid to iron in high heat and ruin it further. I sewed back the loose snaps and replaced the missing velcro with metal snaps. The flower headband belongs to a Sindy wedding outfit that wasn't in the lot so Sindy is wearing it with this dress instead. Just like one can never go wrong with a brunette Sindy, one can never go wrong with a headband on a big headed doll! I'm thoroughly enjoying this new vintage doll venture. As fun as it is to collect and seek out vintage fashion dolls like Francie, she's outrageously priced most of the time and it's very difficult to find her in good condition for a good price. 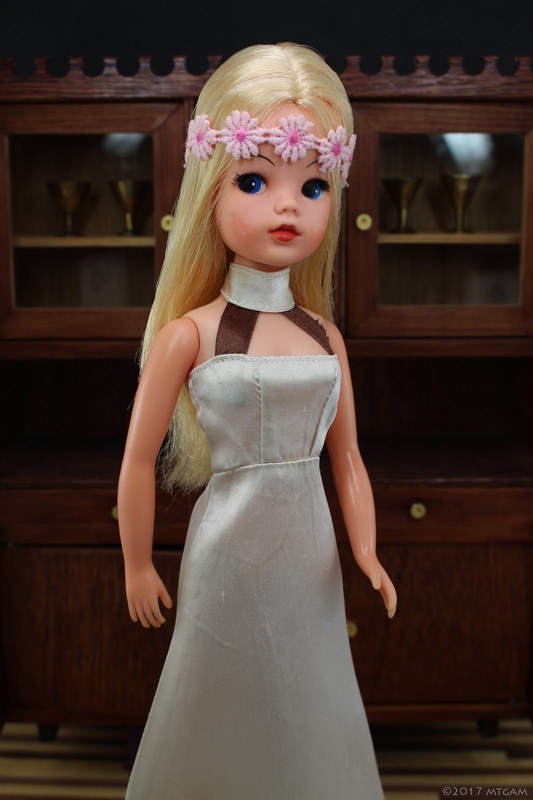 Sindy dolls can be pricey too at times but you can still get good ones for reasonable prices. 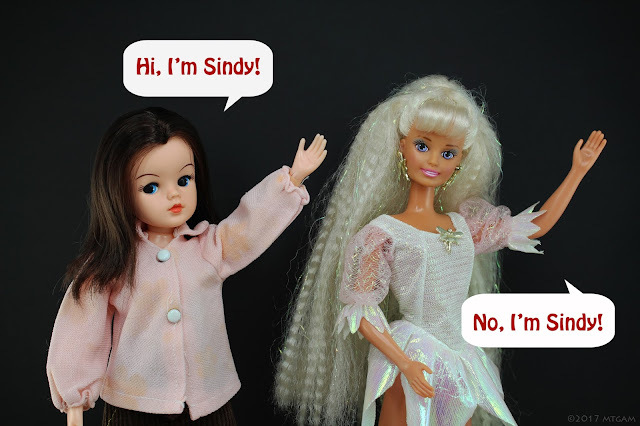 I can see Sindy as Francie's big-headed friend from the UK! ....And to think the spark to this new love affair really only began when I rediscovered my sister's old doll. The only Sindy dolls that I owned during my chidlhood were the Hasbro ones and I loved them! I had one that had side glancing eyes and wore like a gala dress. I remember also that my cousin had a playset and it was quite cool, very 90s. Loved your pictures, by the way! Thanks! I wish my little sister was more interested in dolls when she was younger. 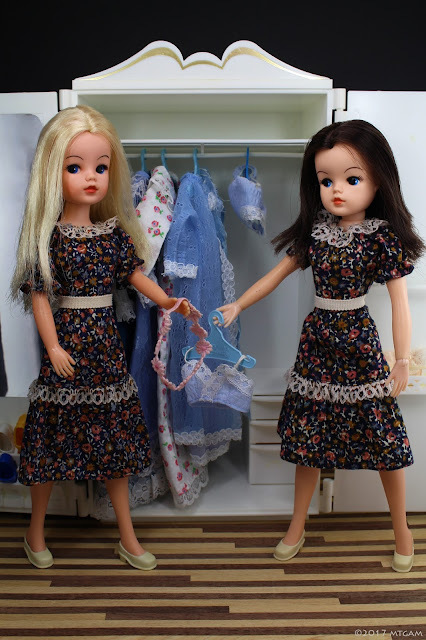 Then maybe we would have had more Sindy dolls lying around! 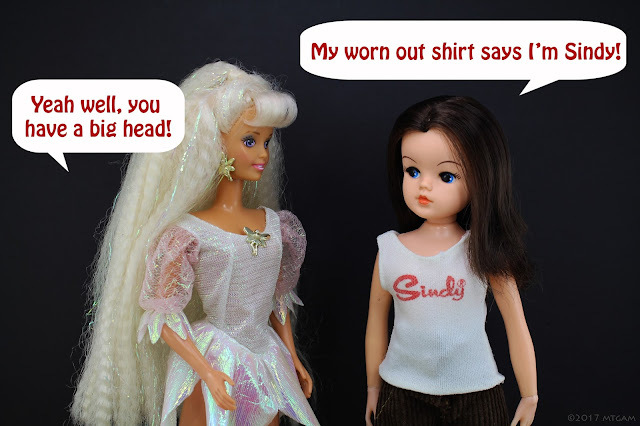 Great job fixing up the older Sindy fashions. I have a brunette Sindy by Pedigree. I never bought the blonde one by Marx - partly because her head seemed too big and partly because I gave her furniture and items to my Barbies. LOL @Sindy furniture being in an "antique mall"
I've been rediscovering Pedigree Sindy too. She has quite a different look from Barbie, and for may years I thought she was too doll-like and unrealistic, but now I appreciate it for variety (isn't that usually how it goes).